L’Écume is one of the few places where I feel at home away from home. 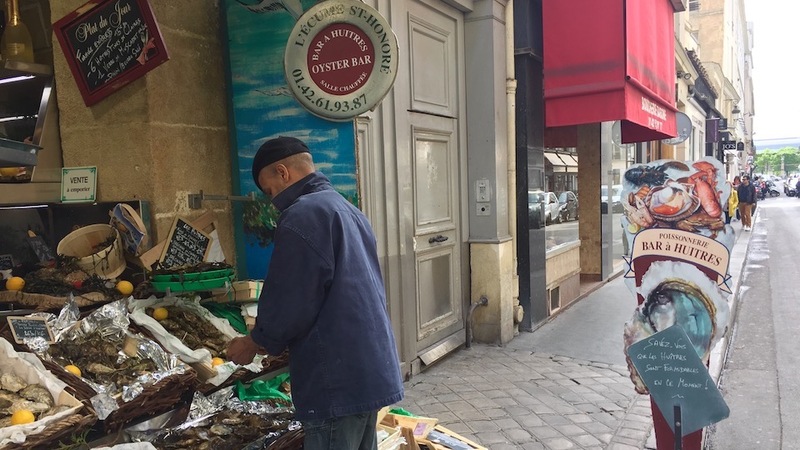 I simply love the 1er Arrondissement; it’s a part of the Ville Lumière crammed with signature retail shops, fancy chocolatiers and star-studded hotels, yet still has down to earth, relatively inexpensive jewels such as this little crustacean/shellfish bar where the locals like to hang out. Actually, we’re all blessed: because with the Louvre and beautiful Place Vendôme nearby – and their never waning hordes of tourists – L’Écume Saint-Honoré’s owners might have just as easily decided to play the touristy food card, replete with styrofoamed crêpes and microwaved frozen quiches. It is to their credit that they chose not to inflict such punishment on the world’s food and wine lovers. So just stroll up to L’Écume Saint-Honoré (walk-ins are welcome), perch on a stool and enjoy a fresh seafood lunch and a short, simple but snappy selection of fine French wines (Champagne too), ideal in helping to wash down all the good briny sea and ocean-dwelling stuff on display. Each time I eat here, I greatly enjoy plates of crevettes grises and of langoustines (the latter not exactly cheap but so good). Of course, there are also mixed platters that allow guests to sample an assortment of different critters, marinated fish filets and different kinds of oysters. And the thinly sliced scallop, which the waiters like to suggest in lieu of dessert (for there aren’t any), is especially flavorful. Call me predictable, but whenever I have lunch here, despite the other fine four or five choices to pick from, the fact is I simply love the 2015 Le Fleuron Chéreau Carré Muscadet de Sèvre et Maine Sur Lie, a delightful wine that is easygoing, bright and brimming with early appeal. Chereau Carré owns a number of different Muscadet estates (including Château de Chasseloir and Château de Chesnaie) making Muscadet from roughly fifty hectares of vines in the heart of the Sèvre-et-Maine appellation near the town of Saint-Fiacre on high quality schistose soils. The 2015 Le Fleuron is made from 25 year-old vines and the wine spends anywhere from six to nine months on the lees, depending on the vintage. Bright, juicy and very zingy, it titillates the taste buds with a cleansing wave of bright lemony, minty and iodiney flavors. The 2015 actually boasts sneaky concentration. I really can’t think of too many aperitifs I’d rather have on a warm summer, fresh shellfish and shrimp. By contrast, the 2015 Guy Robin Chablis Montée de Tonnerre 1er Cru is a much richer, creamier mouthful of wine, where the new oak (only 10%, actually) is still showing and in need of a good two or three years to resolve fully. The warm 2015 vintage only makes the wine’s tactile personality stand out more than it does normally (for example, the 2014 vintage was much more dainty and vertical). Although I realize I could easily be accused of rarely coming across a Chablis that I really don’t care for (it does happen, of course), I just happen to like Guy Robin’s wines. The estate was built by Guy in the 1950s and owns large parcels of very old vines that confer unusual depth to the wines.Today, the estate is run by Marie-Ange Robin. Her Montée de Tonnerre is one of my favorites. It’s an especially complex, interesting wine from this famous Premier Cru, made from grapes grown in all three of its lieux-dits: Chapelot, Côte de Bréchain, and Pied d’Aloup, each of which bring something unique to the wine’s final composition. Clearly, you realize why with similar study matter in my glass, I never have any trouble happily lingering at L’Écume Saint-Honoré right up until closing time.